If You're Going to Cruise through Life, Enjoy the Read! Touring presents many of us with an opportunity to enjoy an environment that can only be described as foreign, regardless of how close to home our travels take us. The beauty of our surroundings is never more evident than when we choose lodging that offers a room with a view. Many of us, for reasons of economic necessity, spend our lives in dreary little urban apartments, in indistinguishable homes on very small plots of land, or in temporary living arrangements that seem to last indefinitely. We repair to our dwellings, shut off entirely from useless views of the outside, and immerse ourselves in books or television programs that will warp us through space to another place and time. We close the door behind us and seek solace and respite in our calmer thoughts. Few are fortunate enough to spend their lives amidst grand scenery with vistas stretching for miles to the horizon. When your backyard is a mountain range, a lake, a nature preserve, or even a rolling farm, you are granted an inner peace with no visual boundary. The world appears at your doorstep and anything seems possible. In the absence of such daily splendor, we tour to recharge our batteries and gaze longingly at snapshots that will forever endure. Some find travel lodging to be a mundane experience, nothing more than a place to sleep while en route to a destination. I, however, recognize and appreciate a perfectly straightened room, an immaculate bathroom, and a chair in which to sit and admire a spectacular view in late afternoon. And each day is thankfully similar. While I am away at dinner, or enjoying an after-dinner drink on a moonlit veranda, a maid is turning back my sheets and leaving a customary mint behind! If you plan and choose carefully, old country inns, antique bed and breakfast establishments, rustic hunting lodges, as well as other types of unusual housing provide an inexpensive alternative to the motel chains found on the main highways. In tandem with nights spent camping in the wild, rustic inns offer a unique and complementary experience. A few examples come to mind. 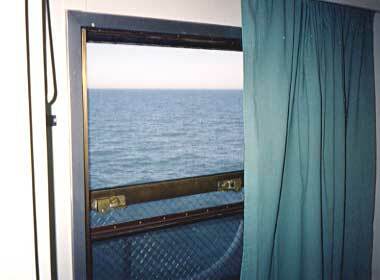 The trip across Lake Michigan by car ferry is a four- or five-hour journey that gets boring pretty quickly, especially when you are left to mingle with the hordes of travelers viewing this lake crossing as nothing more than an impediment to high-speed automobile travel. My motorcycle is strapped down below in the ship's hold, precariously situated between station wagons, Winnebagoes and railroad tankcars. Up on the main deck, children are running amok; seating, though plentiful, is less than peaceful; food service is available as a short diversion; and sunbathing on the bow requires the ability to withstand very strong and often cold wind. I seek out the ship's Purser and inquire about a stateroom. The ship's Steward shows me to my room which includes a couch that doubles as a fold-down bed, a small table, and a small sink. Most importantly, there is an open window with a wonderful view. I read for a while and then decide to try and nap. I prop my head atop a pillow and use a blanket to insulate my body from the crisp lake air that fills the cabin. I am quickly lulled to sleep by the gentle sound of the ship's engines. Three hours later, a rapping on the cabin door awakes me. "Dock Call!" shouts the Steward. As we make port, I splash some water on my face, gather my belongings and head down into the hold, where the crew has already unstrapped my motorbike. Having one of the smallest vehicles, I am the first one allowed off the ship. I start the motorcycle and slowly maneuver over railroad tracks and wooden planks, and eventually clear the dock. Down the road I go, refreshed and happy. The Lake Crescent Lodge at Olympic National Park in Washington state is a typical rustic inn made entirely of logs and stone. As you enter the lodge, you are greeted by a large, two-story-high lobby where guests are seated on leather sofas. A gigantic fireplace warms this huge interior on a cool spring day. I receive my room key and make my way, luggage in hand, up a steep, narrow staircase in the corner of the great room. On the second floor of the main inn, there are about a dozen quaint guestrooms. My room is number five. I enter the room and see a bed, a table and chair, a small sink, and not much more. The walls are made of knotty pine, decorated with a few wildlife paintings. There is no telephone, no television, and no bathroom. The "central" bathroom and shower facilities are located at the end of the narrow hallway outside my room. The room itself, although Spartan in accoutrements, is neat and clean. I pull open a large unscreened window and take my first look at a spectacular view. This is perfect. 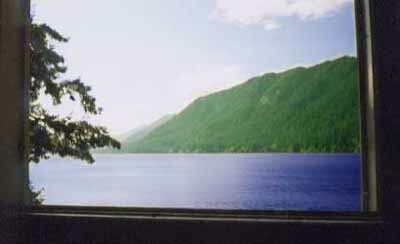 Below me sits the shimmering blue water of Crescent Lake, an L-shaped lake stretching several miles in each direction and at least a mile to the opposite shore from my vantage point. Thickly forested Pyramid Mountain rises three thousand feet, directly across the lake. A flock of honking geese fly across my view from right to left. I stand there looking out my window, awestruck. Aspen, Colorado, is one of my favorite towns in the whole wide world, at least during the less crowded, non-skiing off-season. I began to think about Aspen days earlier and miles away, while camping out in a scorpion-filled desert, and hotter than all get out. I need high altitude relief from the heat and a more civilized atmosphere. I can't get to Aspen quick enough. 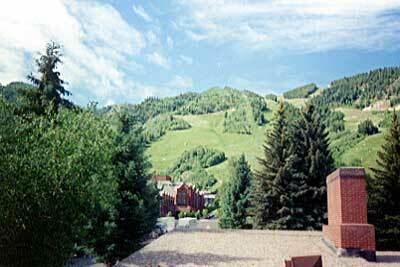 Upon arriving in a disheveled condition, I am welcomed with open arms at the Limelite Lodge, located in the heart of Aspen. The town and its surroundings are at my disposal. Daylight hours can be spent hiking nearby across pristine wilderness at high elevations while evening hours can be spent at the Hard Rock Cafe or Planet Hollywood. The scenery is beautiful, the town is beautiful, and the people are beautiful. I must have landed in paradise. From my third-floor perch at the lodge, I look out across Wagner Park, over the tops of all the business structures and dwellings in Aspen. The mountain peaks rise up in every direction. The 11,000-foot summit of Aspen Mountain is very close and clearly visible on this bright sunny day. Interestingly, the town is fairly empty of inhabitants because, as I would later surmise, everyone is out enjoying the myriad of sporting activities available throughout the region. At night, however, the town's streets quickly fill and Aspen comes alive. I clean myself up and choose the Mother Lode for a fine Italian dinner and am not disappointed. After dinner, I roam the streets, window shopping amongst the upscale boutiques, and decide to stop in at Bentley's for an after-dinner drink with the locals. I then make my way over to the Double Diamond to catch a nationally touring rhythm and blues act. By midnight I return to the lobby at the lodge where I become engrossed in an old western movie on the television. As the town finally calls it a night, I am asleep in my bed. The next morning I clumsily wake at sunrise. I look out my window to see the hustle and bustle of all those preparing for a day of outdoor activity. Bicycles are being loaded onto cartops, fishing gear is gathered, and hikers are filling their backpacks and stretching their limbs in the morning sun. I rub the crust from my eyes and decide to go back to bed for a couple more hours of sleep. Key West, Florida, is an unforgettable non-stop party located at the terminus of a spectacular road. The Overseas Highway is a 113-mile stretch of scenic two-lane road over sub-tropical water that connects one key (small island) to another beyond the southern tip of mainland Florida, ninety miles from Cuba. On your right is the Gulf of Mexico and to your left are the Florida Straits. Throughout the Keys which are composed mainly of coral reefs and mangrove swamps; boating, deep-sea fishing and snorkeling appear to be the obvious pastimes. As you bounce from key to key over miles-long bridges, you encounter a unique traveling experience; there is only one path in, and therefore the same glorious path back out. I book accommodations at the Banyan on Whitehead Street. The Banyan (named for a tropical multi-trunked tree) is actually a collection of nine adjacent 19th-century houses further divided into guest suites, each offering a full kitchen, high ceilings with fans, lush tropical views at numerous screened windows, a porch and a variety of rooms. My second-floor suite brings me squarely into the canopy of unusual trees. Even during the off-season, it's a bit pricey, but as your home for a few days during your stay at the Key West party, it is without equal. This is an indulgence well worth the expense as one quickly realizes how splendid it must be to live in Key West year round (except for the occasional hurricane). The hard-drinking and seafood-eating Key West, made famous by Ernest Hemingway and later by Jimmy Buffet, is evident from your first step onto the town's streets, passing one open-air bar after another, Sloppy Joe's, the Hog's Breath Saloon, and Margaritaville being the most famous. Everyone seems to be drunk, happy and well fed, and no one seems to work. Artists and writers abound. In the background, a marimba band is always playing. I stumble around for a couple of days and then head back to reality.